Every now and then it’s fun to engage with a wonder. That’s what sister Kate and I did on a weekend trip to Marfa, Texas. The little town (about 2,000 residents) is about 200 miles southeast of El Paso and 60 miles north of the Mexican border. Established in the early 1880’s as a railroad stop, it has now become a tourist destination due to a famous art installation and the “Marfa lights.” Although the latter was the focus of my interest, I will deal with the art first. I had not heard of him before, but Donald Judd became famous for large installations of art constructed out of wood, concrete, Plexiglas, and metals. The space in which his creation appeared was vital to its effect. 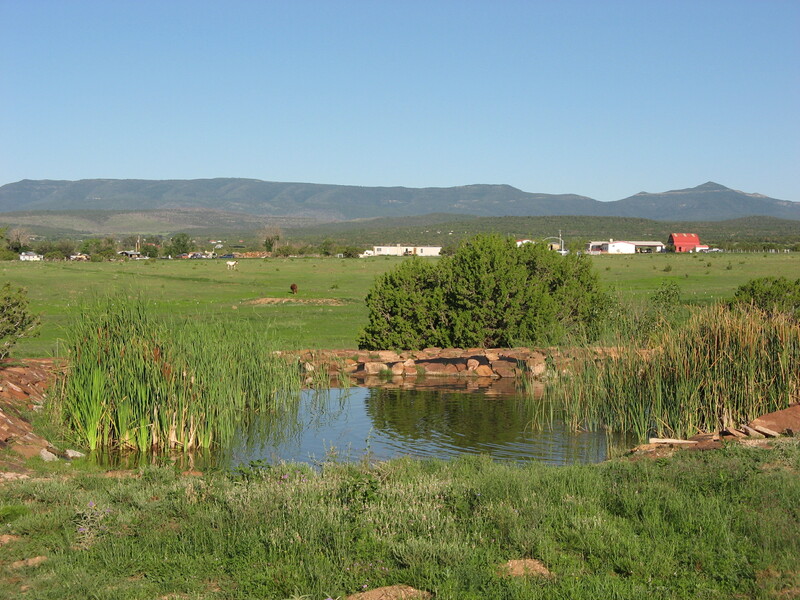 Perhaps drawn by the splendid scenery and the quiet around Marfa, he moved there from New York City in 1971. The residency of this one man kind of transformed Marfa, turning it into a destination for art lovers. He bought the 60,000-acre Ayala de Chinati Ranch and then the abandoned buildings of a U.S. Army fort, which he turned into art spaces permanently to house his own art and that of contemporaries like Claes Oldenburg. Judd was anti-museum, believing that the constant turnover made it impossible to understand an artist’s intent. This would be particularly true of his own huge installations, whose environment is essential to effect. For example, in two large buildings that now house rows upon rows of shining metal boxes with interior panels that vary slightly, one construction seemed to disappear as it reflected light from the windows. On the surrounding acreage, giant concrete boxes of similar concept bask in the sun. 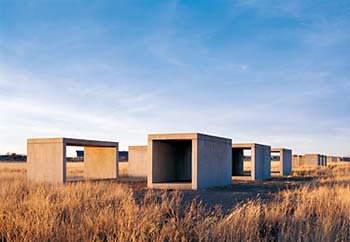 Judd’s vision is sustained by the Chinati and Judd Foundations, and it has become a lure for other artists and individualists who have left their mark on a town full of contrasts. For example, a church has been converted into a contemporary-looking art gallery called The Wrong Store. Down the street a few yards is a shabby congregation of Airstreams. Within easy walking distance is the majestic county courthouse that would be appropriate for a town twenty times as large. And then we have the mysterious lights that are the town’s primary source of fame. Having grown up in El Paso, I had heard about them always and was just plain curious. We were missing by one week the annual “Festival of Lights,” which must be a sustaining event for the town. The Texas Highway Department has built a platform about nine miles east of town where one can go to see the lights. I had heard about how they are there or not, how they move around and change colors, sometimes so large as to be described as “orbs” on the horizon. They have been ascribed to paranormal activity at one end of the spectrum and dismissed as lights from the highway at the other. It would be safe to say that no one really knows what they are. According to information that the historic Paisano Hotel gave us, the first recorded sighting was by a cowhand in 1883, who thought they might be Apache campfires. The lights were seen more often as settlers moved through the area. During World War II, pilots training at the Marfa Army Air Field failed to identify the source from the air. Some material says that the lights only appear 10 to 20 times a year, but perhaps that pertains to only the fancy orb sightings. My impression is that, depending on the weather, something is seen often enough to justify the construction of the viewing station. As we watched, families with children came and went. In this era when young people are exposed to so much mind-blowing visual drama in the media, one wonders how impressive twinkling lights can be. It seemed to me that the parents were the ones who were really excited, eager to share something that still struck them as magical. At first we saw nothing on the dark horizon except one blinking red tower light. After a while, one light appeared and then another, then two at a time, then darkness, then one in a new place, and on and on. The harder I looked, the more I could see, and perhaps there is a message in that. The lights were bright, and you could easily mistake them for car lights at one glance. As we watched, however, their behavior was uncharacteristic. They didn’t move steadily as a traveling car would, and it made no sense the way the brightness varied and the location and groupings changed. Something about it was just odd. The trip was punctuated by other moments of natural wonder. As we drove down the highway, a beautiful and solitary young chestnut horse broke into a gallop along the fence line, apparently just for the fun of it. Then in a young tumbleweed in a field, there was a huge, black, Darth Vader-like grasshopper edged in gold that unfurled red wings. And most affecting of all was the wonder of the lush landscape our entire, eight-hour drive south to Marfa. In New Mexico we have been enduring severe drought for three years, the land drying up and seeming to die in front of our very eyes. And then here comes the best monsoon season I have seen since I moved here in 2005. Land that was grazed down to the dirt is covered with new growth, and every day splendid clouds pile up in the bright blue sky and drop rain here and there in unexpected blessing. This is what I would call a “blooming moment,” because our water situation remains desperate, and there is no indication of long-term relief. Nevertheless the realized potential of the formerly barren ground is stunning, and every downpour is a treasure. So what comes next? Why has this happened? How long will it go on? Is the climate changing in some improbable way? Maybe it’s good not to know. Maybe it’s good to take time every now and then to enjoy something beautiful, extraordinary, and transient—not knowing what it means, not needing to know what it means, just grateful and easy with wonder. 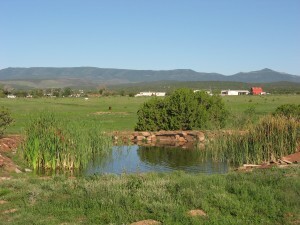 Ellen, I enjoyed reading your article on Marfa! I was born in Marfa and my father worked at Fort D.A. Russell at that time. In fact, they tell me that we lived out there when I was born. We moved away for a couple of years, but I attended first through third grade there. Both of my brothers graduated from Marfa High School. And my parents and one brother are buried in the Marfa Cemetery. I have many wonderful memories of Marfa. It has changed a lot since we lived there. We do not have relatives there anymore, but we still enjoy going back to visit. I look forward to seeing you at the Burges reunion next month! Shucks, sometimes just can’t make out the images!! I just sat down to write Kate and ask about your trip. Instead I read your commentary. Glad it was a good trip. We moved here in 1993 and we had monsoons every summer until about 2005-as you said. Every afternoon ( just at the time we fed the horses in the evening) the rains started. We had weeds almost taller than we were. Then about 2005 ( couldn’t remember about when that started() everything just dried up. One summer I was mad-mad- mad evreyday because I just wanted to smell the rain! I just sat down to write to Kate and ask about your trip. Instead I read your description. And thanks for the date of when the drought seemed to begin. When we first moved here in 1993, we had monsoons every summer, and weeds taller than we were. Then the monsoons quit ! I knew it had been a number of years that we have had very, very little moisture.